Self-published, 2018. In English. 52 pp., 8x8". I was raised during the height of the Cold War, when the threat of nuclear war loomed between two superpowers. The dramatized depictions in TV and film of such an apocalyptic demise both intrigued and scared me as a child, yet the actual historical record of the atomic age was full of antiquated, black-and-white images that seemed dated and a world away. This series re-contextualizes a legacy of atomic bomb tests in order to keep the ongoing nuclear threat fresh and omnipresent. Imagine if the advent of the atomic era occurred during today’s information age with tourists gathering to view bomb tests at the “safe” distances used in the 1950s and sharing the resulting cell phone photos online. 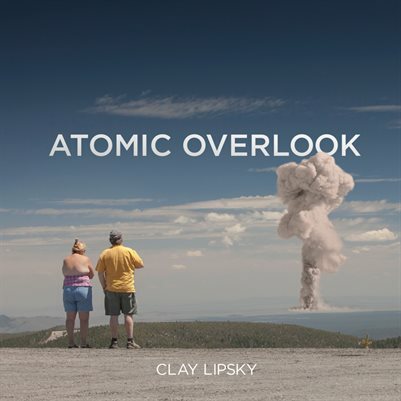 Atomic Overlook also speaks to the current state of the world, a voyeuristic, tourist filled culture where catastrophe is viewed as entertainment by increasingly desensitized masses. The iconic mushroom cloud, a loaded symbol burned into our collective subconscious, represents a triumph of science, apocalyptic destruction and once even national pride, but in this case can also serve as metaphor for larger societal issues such as global warming, nuclear power, industrialization, and pollution. [These] issues...seemingly breed an adopted apathy, where individuals can do little but stand by and watch.